Photo provided by Olivia McClure -- Ronnie Moore (right) of New Orleans, a regional field secretary for CORE during the 1960s, marches next to former Deacons for Defense member Tommy Brumfield of Bogalusa during the dedication of a National Register of Historic Places marker last weekend in Bogalusa commemorating the late Robert Hicks, who led the fight for civil rights for blacks in Washington Parish during that period. Photo provided by Olivia McClure -- Jackie Hicks points to a photo of her husband, Bob, on the new National Registry historic marker in front of their former home in Bogalusa. The home was attacked in the 1960s by Klansmen angry that Hicks, a civil rights leader in the city, was housing national CORE organizers. 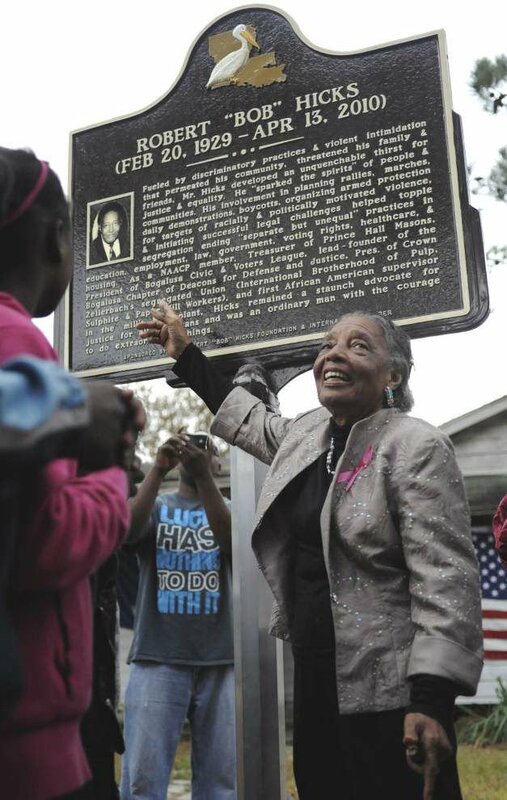 Photo provided by Olivia McClure -- Barbara Hicks Collins, who organized the movement to get her parentsâ home on the National Registry, shows pride in the first historic marker in Washington Parish commemorating an African-American. Her father, Robert Hicks, coordinated Civil Rights efforts there in the 1960s and led the 100-mile march to the State Capitol in Baton Rouge in 1967. Photo provided by Olivia McClure -- From left, State Sen. Ben Nevers, D-Bogalusa, Jackie Hicks with an unidentified granddaughter , and Elder Christopher Matthews of Bethlehem Baptist Church of Bogalusa during a march last weekend commemorating 1960s civil rights leader Robert Hicks. In Bogalusa, a mill town once ruled by white law enforcement and saturated with the Ku Klux Klan — often one and the same during the 1960s — a National Register of Historic Places marker now stands in front of a modest, aging gray house. There, in 1965, Robert “Bob” Hicks rallied African-Americans to take up the fight for integration and civil rights. Hicks’ home, a Klan target at the time, was guarded night and day by the Deacons for Defense and Justice, an organization that remains a little-remembered slice of Louisiana history. Armed Deacons units quietly sprang up throughout the region, protecting civil rights activists and Northern organizers during the tumultuous decade, while raising alarm in the highest circles of power. The Deacons began in 1964 and all but faded from the scene by the end of the decade. The historic marker recognizes Bogalusa Deacons founder Hicks, who worked at the once-segregated Crown Zellerbach paper mill and headed the local Voters League. He died in 2010 at the age of 88. On Saturday, his widow, Valeria “Jackie” Hicks, led a group of family, friends, community leaders and well-wishers on a four-block march from Bogalusa’s Bethlehem Baptist Church to the home, where the marker was unveiled. Both of the Hickses were at the front of a 10-day, 100-mile march from Bogalusa to the Capitol in Baton Rouge in 1967. Federalized National Guard troops were required to get the marchers through Livingston Parish, where there were violent confrontations in Satsuma and Denham Springs. The Deacons, who also had chapters in Jonesboro, Ferriday and Natchez, defied the national nonviolent civil rights agenda by arming themselves. Martin Luther King Jr. declined to visit areas where the Deacons were active and visible. But the Deacons’ brand of activism thwarted most Klan attacks in Bogalusa — a blue-collar paper mill town that earned the title of “Klantown, USA” in a 1965 article in The Nation magazine — and other places in Louisiana and southern Mississippi. While shots were frequently exchanged between the Deacons and Klan groups, there is no record of anyone dying. Klansmen threatened to bomb Hicks’ house in February 1965 when he allowed two young white Congress of Racial Equality, or CORE, workers to stay the night. Armed Deacons poured into the house, ready to protect the workers and the Hicks family from Klansmen and Klan-sympathizing police officers. Bob Hicks started a movement by opening his doors that night, said former CORE field secretary Ronnie Moore, 74, of New Orleans. Moore had worked in Jonesboro, where the first Deacons chapter started, and was in Bogalusa to organize a CORE project. The Deacons were unofficial protectors of the black community, Jackie Hicks recalled. They didn’t stop in Bogalusa, however. Tommy Brumfield, who was only a teenager when he became a “foot soldier” in the Deacons, took part in the 1967 march to Baton Rouge. Brumfield recalled the group’s run-ins with KKK members during their journey, especially in Livingston Parish. Klansmen “put logs and things across the road and they attacked us,” Jackie Hicks said. The Washington Parish marchers made it to the steps of the State Capitol, where National Guard soldiers and Louisiana state troopers guarded them as they rallied. Back home in 1971, Bob Hicks filed a lawsuit against Crown Zellerbach, which would not allow black workers to hold management positions despite the Civil Rights Act of 1964. Hicks won and became the mill’s first black supervisor. The marker now in front of his house is co-sponsored by International Paper, which took over Crown Zellerbach. 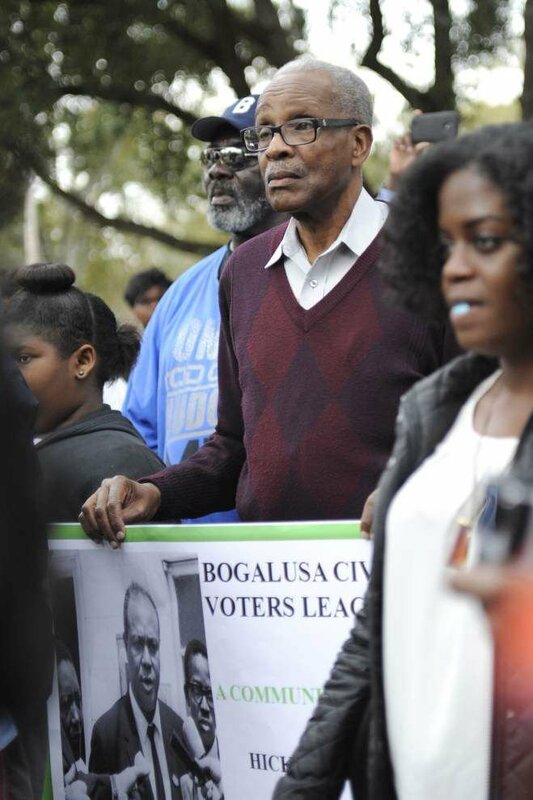 Much has changed in Bogalusa since the 1960s, said state Sen. Ben Nevers, D-Bogalusa, who on Saturday marched next to Jackie Hicks and carried a sign listing dates that key civil rights laws were passed. Nevers grew up on the white side of town. “Nobody told me to go to the back of the bus, or that I couldn’t drink out of that water fountain, or that I couldn’t vote,” he said. People must learn about the town’s past, although dark, to solve current problems, he added. “I hope and I wish that what we’re doing today inspires the young people,” said Barbara Hicks Collins, Bob and Jackie Hicks’ daughter. After Jackie Hicks pulled off the cloth covering the marker, she smiled. This story is from the LSU Manship News Service. Reporter Renee Barrow contributed to the article.